Eating peanuts helps infants avoid allergy, even after pause. (AFP) - Feeding infants small amounts of mashed-up peanuts early in life may help them avoid developing allergies, even if they stop eating peanuts for a year in early childhood, researchers said Friday. 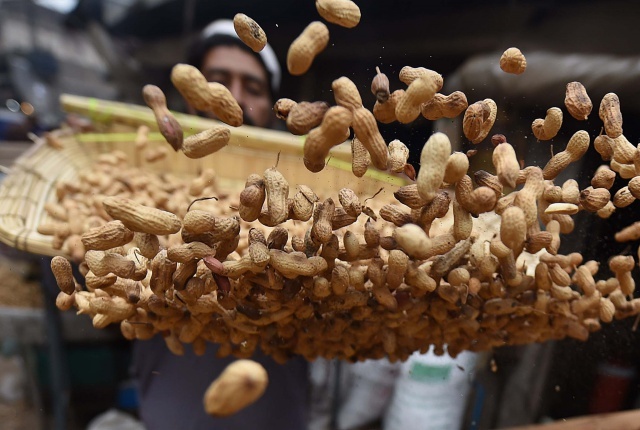 The findings in the New England Journal of Medicine have prompted global health authorities to reconsider long-held advice that babies should avoid certain foods, amid a rise in potentially fatal peanut allergies among youths in recent years. "The early introduction of peanut to the diets of infants at high-risk of developing peanut allergy significantly reduces the risk of peanut allergy until six years of age, even if they stop eating peanut around the age of five," said the study, led by King's College London. The findings offer a follow-up to groundbreaking results announced last year from a study known as the Learning Early About Peanut Allergy (LEAP) trial, which included more than 600 children. It found that high-risk babies who ate peanuts by age 11 months experienced a substantially lower rate of peanut allergy by age five than infants who avoided peanuts. The latest study, called LEAP-On, includes evidence gleaned from following 550 children age five to six, some of whom stopped eating peanuts, while others carried on. A halt for a year resulted in "no statistically significant increase in allergy," said the study, noting that three youths who ate peanuts and three who avoided peanuts developed allergies between age five and six. "Overall, the study saw a 74 percent relative reduction in the prevalence of peanut allergy in those who consumed peanut compared to those who avoided." Peanut allergy was far more common (18.6 percent) in children who avoided peanuts during the trial, than those who ate peanuts (4.8 percent). The LEAP research has led to calls for change in feeding recommendations for babies. Until now officials have urged parents to avoid giving nuts to infants and toddlers -- particularly those with other conditions such as eczema -- until the age of two or three. One in 13 children in the United States (eight percent) suffers from a food allergy, and the US Centers for Disease Control and Prevention has said food allergies among children rose about 50 percent from 1997 to 2011, for reasons that are unclear. Peanut allergies affect as many as one in 50 children in Britain, and are a growing concern in parts of Africa and Asia as well. The US National Institute of Allergy and Infectious Diseases on Friday asked for public comments by April 18 to help craft new US guidelines to address the prevention of peanut allergy. "In the past we had recommended that complete avoidance was best but clearly now, that paradigm has to change," said Punita Ponda, assistant chief in the Division of Allergy and Immunology at Northwell Health in Great Neck, New York. "We are just beginning to have reports from studies like this one that give allergists some scientifically grounded data to use when they make recommendations," added Ponda, who was not involved in the study. Experts agree that many questions remain to be answered before parents can know how to adjust their children's feeding habits to match the latest science, and that a doctor's advice should be sought in the meantime. "For instance, what are the correct amounts of foods needed to induce tolerance, and what is the age where it is too late to induce tolerance?" said Barry Kay, emeritus professor of allergy and clinical immunology at Imperial College London. "So, don't try this at home yet," he added.